Thats all your opinion but we know what we are doing so thats all cool and its a m5r2 btw the block is not going to crack at 500 horse and your blower should be screaming at 8 psi cause supercoupe guys can pump theirs up to 16 easy. This statement has proven your ignorance/youth. You do not understand the concepts of CFM, It takes a TREMENDOUS amount more airflow to keep a V-8 at 8PSI compared to the Super coupe's V6. Are you going to believe some guy in New York, or a guy that actually factually HAS A M90 roots blower on a 5.0 with similar specs, and has been dyno'ed. Go find me a 5.0 powered ford ANYTHING with an M90 ontop with a stock long block that makes more than 450hp and I will eat my shoe, film it, and put it on youtube. A stock 03-04 mustang cobra makes 390hp at the crank, and that is with a much more efficient M112 blower, and a far more advanced engine right out of the gates. If an M90 could make that kind of power, why did they bother using the more expensive, more advanced M112? Think what you want, but I've never heard of them, but stock 5.0's do not take that kind of power kindly, nor will yours make that much. Stock 5.0 mustangs make 170whp give or take. I was using the 03-04 390hp cobra as an example of blower efficiency. 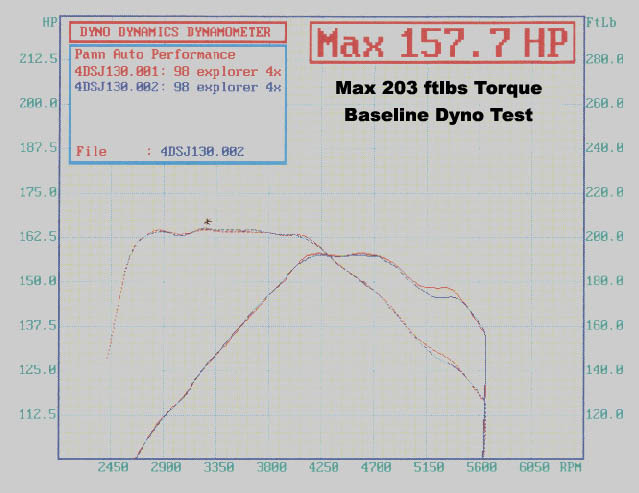 Here are the Dyno results from a bone stock 1998 5.0 V-8 explorer (GT40P Heads) from Torque Monster (Company that builds V-8 ranger swap headers). Baseline Dyno test results for our 1998 Ford Explorer 5.0 V8 "Eddie Bauer" Edition 4x4 factory stock. Ha you must like making your self sound smart and tell others there wrong . But i dont care what you say cause i know what im doing and how to build a motor so thanks for your input. The 95 Mustang was rated at 215hp at the flywheel. No, You do not know what you are doing if you think an M90 is going to make 500whp on a nearly stock longblock. Period. learn something and move on, sorry kid. UMMM, no. The 'stang 5.0l had anywhere betwwen 225 and 205. The engines are all basically the same, the difference was was the way they tested. Up to 92 (225 hp) they tested just the engine. 93+ was tested with all accessories on the engine. Edit: I wouldnt even think about building over 400 HP from a factory block. They will split in half!! It may hold up for a while, but be forewarned. You've got nothing to worry about now. Your not making anywhere near enough power to split the block, not with a m90. They cant move enough air to make big power numbers on a 5.0l. Trust me on that, I'm a major boost junkie! !